Home Tags Posts tagged with "Russian food"
This is a good example of one of the things I’m trying to do on Food Perestroika: reinvent Russian classics. All the required ingredients are here: eggs, wheat, milk, hard cider (which is something I like to use in pancake batter), butter, crème fraîche, salmon, lemon juice, even chives and onion. But the actual blini are nowhere to be seen — my recipe is “inside out”. 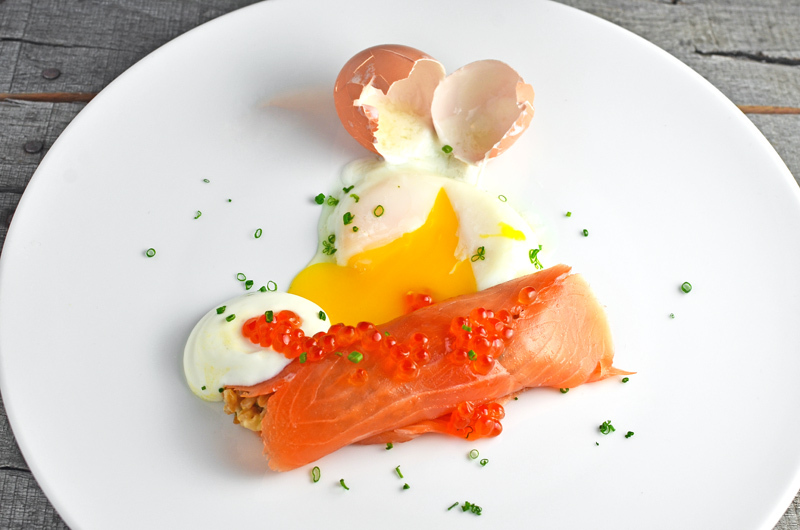 The smoked salmon wraps a mixture of cooked farro (that’s wheat to you), and the eggs, instead of being mixed into a batter, are poached at low temperature. The lemon juice goes into an egg white hollandaise, courtesy of Chef Steps again (my recent zur belish recipe used the yolks, now here’s something to do with the whites). 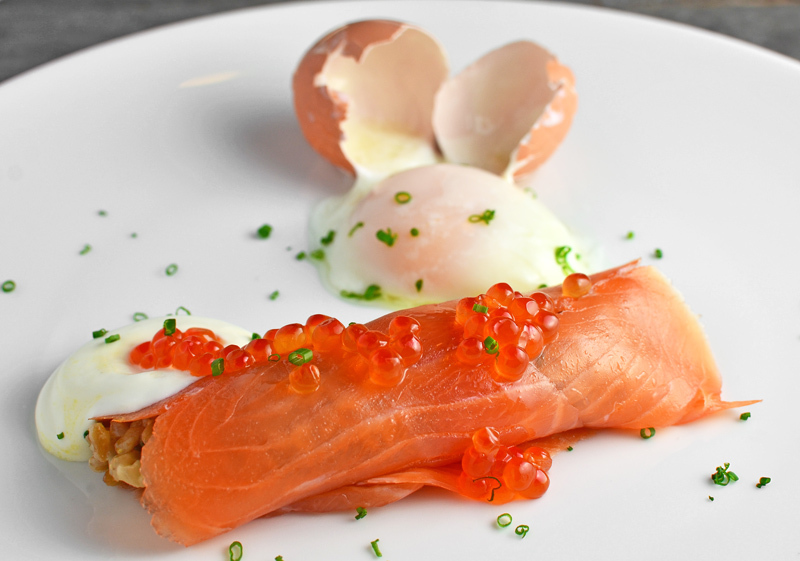 The chives and salmon roe are traditional pairings with salmon, and hey, they look pretty! Soak the farro in cold water for 25 minutes, then drain and reserve. Melt the butter in a small saucepan over medium heat, then sauté the onions until transluscent. Add the farro and the hard cider, and cook for a couple minutes, stirring frequently. Add the chicken stock, simmer for 5 minutes, then cover the saucepan, and cook over low heat for another 20 minutes. Add the milk, season with salt [moderately, since the smoked salmon is already salty], and cook for 10 more minutes. Let rest for 5 minutes. Mix in the crème fraîche and chives, and reserve. Combine the vinegar and onions in a small saucepan, and reduce by half over high heat. Cook the eggs in their shells in a 75 C / 167 F water bath for 13 minutes. Take the eggs out of the water, and proceed with assembly immediately. Reheat the cooked farro in a small saucepan over low heat. On each plate, arrange one or more slices of salmon to form a 15 cm disc. Spoon some cooked farro in the middle, then wrap the salmon into a log shape, placed in the center of the plate. 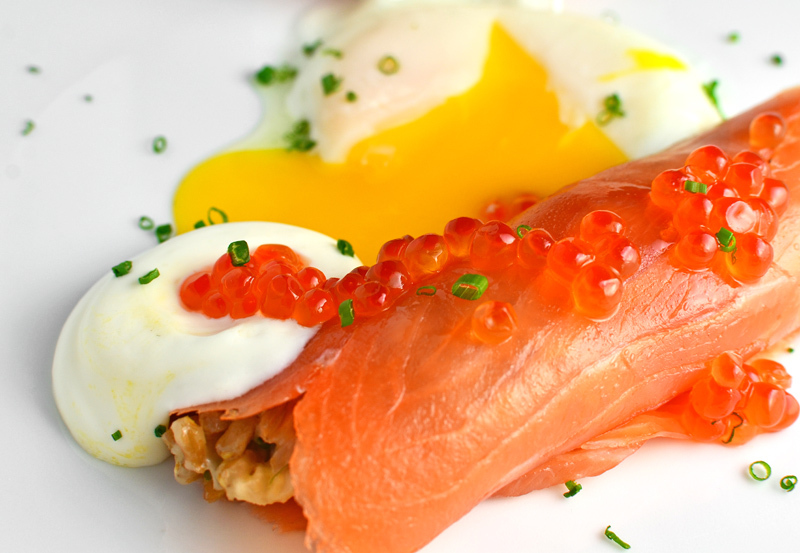 Pour a dollop of hollandaise sauce out of the siphon at one end of the salmon “blini”, and spoon some salmon roe on top. Break a poached egg on the side, leaving the shell on the plate, and cut the egg yolk with a knife. Sprinkle with chives, then serve immediately. If you find yourself in Canada, you might try the impossibly sweet yet addictive maple syrup pies. In New York City, Momofuku Milk Bar has the infamous crack pie, which isn’t all that different, except it’s made with cane sugar and a funkier crust. As a birch syrup lover, I wanted to come up with a similar dish for the other side of the Iron Curtain. Siberia being a little to Western Russian what Canada is to the United States, I decided to create a Siberian birch syrup pie. One may ask: do people really eat custard pies in Siberia? Aren’t Siberians just a bunch of alcoholics who push frozen planes along their airport tarmacs while dodging meteorites? (Tupolev-134, no less.) It’s time to shake off clichés! Let it be known that modern Siberians do eat all kinds of pies. And starting from now, add birch syrup pie with kefir ice cream to the list! The Siberian pedigree is reinforced by the presence of pine nuts, which are found all over Siberia — more on this at siberianpinenuts.com. Once toasted, they add a nice bitterness to the dish. Compared to some Canadian recipes, I’m keeping the sugar level in check, and to balance the flavors from the birch syrup, I’m making a tangy kefir ice cream, topped with a piece of crispy bacon to add a salty note. Many of you have probably noticed by now that this is a Russian food blog. But it never hurts to state the obvious once in a while. And to drive my point home, I just bought russianfoodblog.com (note to Google: it spells Russian food blog). So from now on, and until I get tired of spending my money on not-quite-random-yet-not-quite-necessary domain names, you can access all the contents of this blog using russianfoodblog.com. Like my About page: russianfoodblog.com/about/. Or my reviews of Russian restaurants: russianfoodblog.com/category/restaurants/russian-cuisine/. Only today did I realize that if you google “russian food blog”, Food Perestroika doesn’t appear in the first 10 pages (I didn’t look beyond that). Moreover, all of the blogs on the first result page, though sometimes quite interesting, only post a handful of articles a year, when they haven’t stopped all together. Don’t I deserve my 15 minutes of fame, too? Sure, neither my blog title nor my tagline explicitly use the words “Russian”, “food” or “blog”. It’s also true that this is not only a Russian food blog, in that I write many posts that talk about other topics (such as food-serving establishments and travel) and other countries (such as Hungary, Ukraine, Georgia, and Azerbaijan, all of which are only so far from Russia). I guess I’m being too subtle for the world’s foremost search engine, and I apologize. So Mr Google, please take note. I’m going to spell it out for you: this is a Russian food blog. It is a blog that talks about Russian food. A food blog, with an emphasis on Russia. 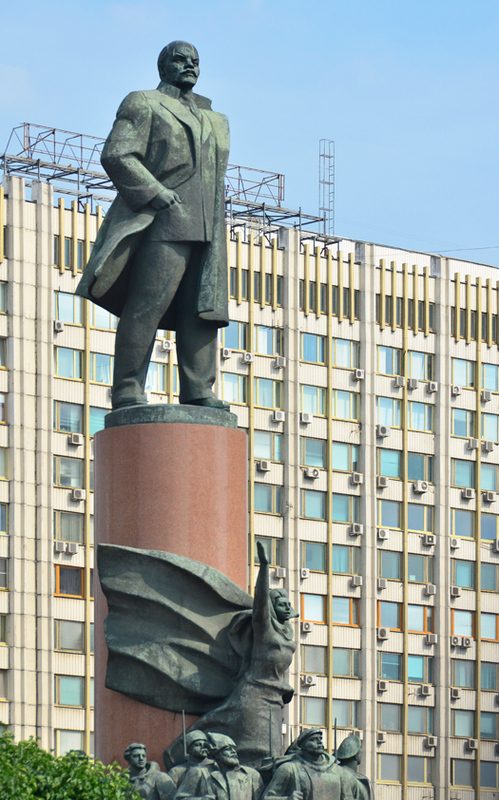 A blog with posts on Russia and food, or if you prefer, on food and Russia. A blog that looks at Russia through the prism of food. Russian food, aka the food of the Russia, is discussed here, using blogging as a medium. Russian. Food. Blog.